What is 11 – hydroxy – D9 – tetrahydrocannabinol? 11-hydroxy-D9-tetrahydrocannabinol (11-OH-THC), usually referred to as 11-hydroxy-THC, is the main active metabolite of tetrahydrocannabinol (THC), which is formed in the body after cannabis edibles are consumed. THC-A exists natively in Cannabis Sativa L. When it is denatured with heat it decarboxylates and we are left with D9-tetrahydrocannabinol. When we eat an edible, our liver (through the process of glucuronidation) converts D9-THC into its glucuronide form (11-OH-THC). 11-hydroxy-THC is more psychoactive per volume than D9-THC ingested via combustible smoke or vapor. This means that the dosing and titration of cannabis edibles is a major hurdle for researchers, product developers, legislators and regulators. 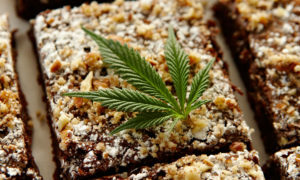 Why are cannabis edibles more potent that cannabis smoke or vapor? Usually when a drug is swallowed, its concentration is greatly reduced before it reaches systemic circulation. 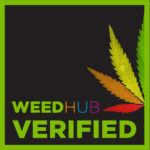 D9-THC undergoes an enhancement in potency when swallowed and converted to metabolite form in the liver. In its metabolite form, it more readily crosses the blood-brain barrier achieving a greater potency than if it were inhaled as smoke or vapor. What is the correct dose for cannabis edibles? This means that an effective, or safe, dose for swallowing a cannabis edible is not consistent when compared to inhaling cannabis smoke or vapor. The bioavailability of most drugs is reduced after it is metabolized by the liver, and little is left of the active drug when it enters the rest of the circulatory system, but D9-THC is an exception. Due to its low first pass effect, D9-THC should be ingested in lower doses when swallowed than if it were inhaled either as a vapor or smoke. This does not mean that dosing and titration are not a significant consideration when it comes to the ingestion of cannabis when inhaled as an aerosol. These routes of administration bypass the first pass effect and enter systemic circulation via the respiratory system. This means that theoretically you could get just as potent a psychoactive dose when smoking or vaping, if you were able to smoke or vape enough product. In other words, the risk of an excessive dose or titration is more likely when swallowing a cannabis edible compared to smoking or vaping. Another consideration is that swallowing a cannabis edible has a latent onset compared to inhaling cannabis smoke or vapor. From a consumer safety perspective, cannabis edibles present a number of unique challenges ranging from proper modes or routes of administration to efficacy, safety, and titration.